By 6:00 a.m. my 2 year old was wide awake, and the rest of us were quick to follow. It was time to start our first day in Japan!!! We finished up what was left of the airplane food and some of the granola bars and prepackaged peanut butter and jelly sandwiches that I had packed for the plane. 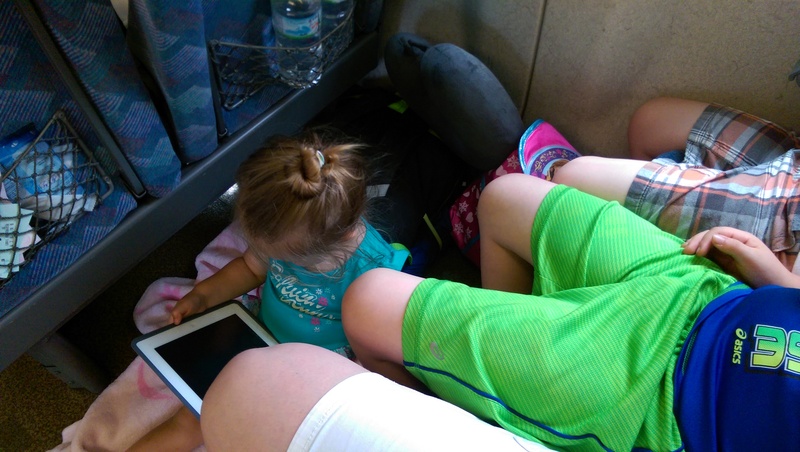 I allowed the kids to watch some shows while I rearranged some of the luggage and backpacks and took a shower. I knew we couldn’t get any official information from the front desk until 8:00 o’clock in the morning, which I also took to be the general starting time, or later, for most attractions. The neighborhood of our hostel. One of the main reasons I went with the hostel that we did (K’s House Tokyo Oasis) was because a friend recommended their chain and I didn’t need anything terribly expensive for such a short single night stay. There also seemed to be some popular attractions in the area. 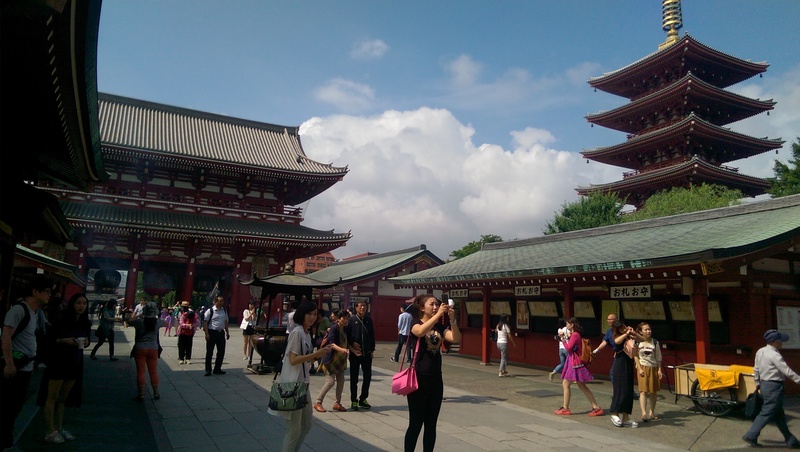 The Senso-ji temple, the oldest temple in Japan, was just a couple blocks away from the hostel. 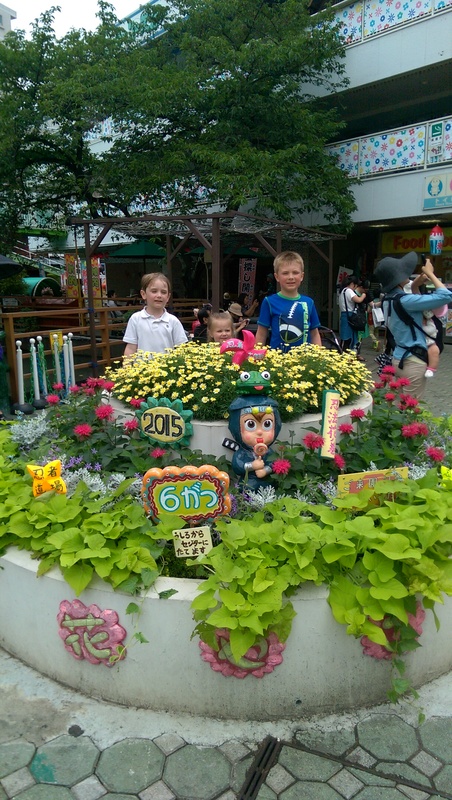 There was also an amusement park and a short train route to the Skytree. Asakusa as also an older, more traditional area of Tokyo so I figured it would be a good starting off point. Once I got everything settled with the front desk for our official “check in” we found out we could keep all of our stuff in the room and didn’t have to check out until 12:00 p.m. I figured with our early start, we could see most of the stuff we wanted to before noon. So we headed out towards the temple to start our official vacation in Japan! Seeing everything for the first time in the daylight was less intimidating. For still being part of the crowded Tokyo metropolis, this was a sleepy neighborhood that was barely getting moving at 8:00 a.m. Within 2 or 3 minutes we were at the entrance to the Senso-ji temple grounds. The traditional images of Japan bloomed suddenly before our eyes. There were little shrines throughout manicured garden and pathways along a pond complete with a man-made waterfall and koi fish. As we wandered around the grounds we made our way over to the main temple itself. Here’s where I find myself ignorant. I really don’t know much about the Buddhist religion or any of the other religious practices in Japan. I made a point of telling the children that our primary purpose was to see how the buildings are different to what they’ve seen before and to just observe people. I reminded them that it was a holy place for the people of Japan, just like a church is in America and Europe. That we needed to be respectful of their desire for peace and prayer and to therefore, not run around and be loud. After walking through the main temple, we saw the area for the fountain and the incense. 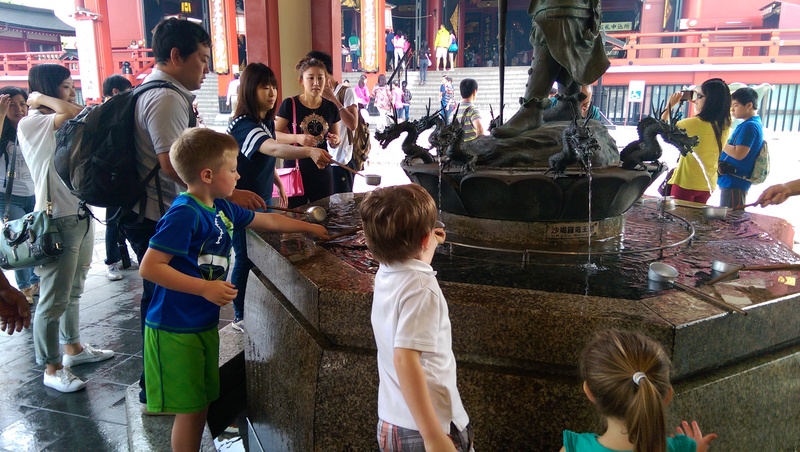 There was a statue of a man holding a dragon and the fountain has several dragon heads sticking out from around it, each a spout of running water. We watched the people use the ladles, made out of tin cups with a wood handle, pour water over each of their hands and some even drank it. I was confused about the drinking verses spitting out because people were doing both. The boys and my 2 year old naturally wanted to participate as they love any kind of water “play.” So I told them that they could do the hand washing but not drink it. This was a little complicated while trying to help all 3 of them without doing something that might be horribly disrespectful, which is my biggest fear for this trip. After they were done, I asked a Japanese woman there if she spoke some English and if she could tell us what the tradition/meaning of the fountain was. We were told that you are washing your hands and cleansing your heart, then you go to the incense and then you pray. I thanked her and we continued to stroll through the grounds of the shrine. When the kids stopped by a tree for a rest, I noticed an elderly couple taking some pictures in the direction of our children. At first I wasn’t sure if they were just taking pictures of the shrine or my kids. But as the kids started moving around to different spots, his camera moved too. We then started to leave towards the market in front of the shrine and he began to follow in front of us, taking more pictures of Madelyn. It was a full paparazzi moment, something I was told to expect, and had also experienced when we traveled in European countries and came across Asian tourists. I take these things in strides as I know that the main motivation is curiosity and seeing a different people in your home country. This happened a few times throughout the day. As we left the shrine we started to walk towards the river where I had seen some greenery on the map and I hoped to find a playground for the kids. About a 10 minute walk from the shrine we found just that. 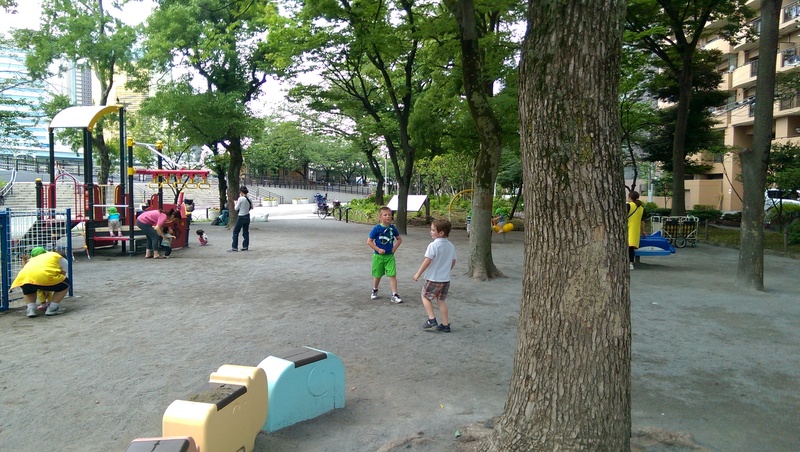 Along the west bank of the Sumida River, between the Skytree train bridge and the Kotoibashi bridge is the playground in the Kuritsu Sumida Park. It was a really cute playground with some traditional climbing structures with slide combos, a sand box, some free standing rocking toys, swings and a giant whale slide. Another feature of the playground, is one that I’m not sure was meant for the kids or the adults. It was an adventure type log course that went in a circle with beams, bars, and wood logs. All I know is that my kids had a blast climbing on it and occasionally an adult would come over and do a few exercises on a part of the structure. Our playground experience offered a picturesque view of the Tokyo Skytree in the background. My intention had been to talk to the tower too. I wanted to go to the top and our hostel host said it was a 20 minute walk to the Skytree from the hostel, and we had to at least have been half way at the park. As I looked at my watch I had to make a choice, it was 10:00 a.m. at that point and I knew that kids really wanted to check out the old amusement park near our hostel. I knew we could only do one of the two things and still make it back by noon. 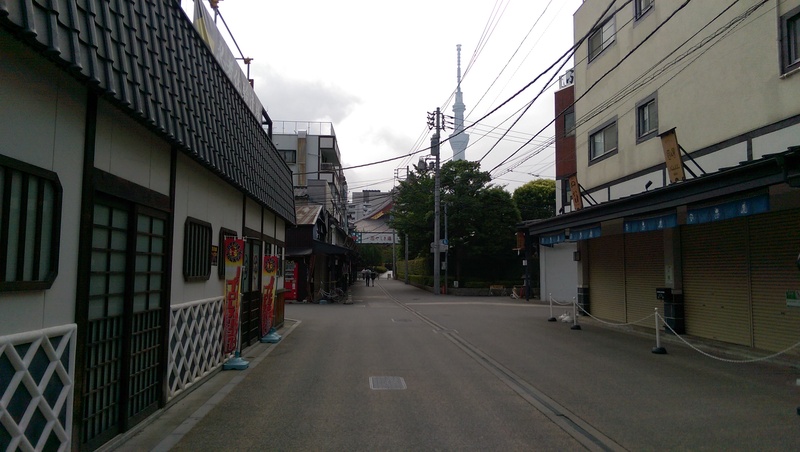 So, taking into account the popularity of the Skytree and my husband’s probably desire to see it over the amusement park when we all returned to Tokyo, we headed back towards the amusement park. Playground in Kuritsu Sumida Park. We decided to walk back through part of the shrine grounds on the way to the amusement park and encountered 2 young Japanese women dressed in Kimono. At first I thought, “Maybe they are advertising some tour or show in the area?” But then I saw that they were taking pictures of each other with their phones. Being how people had no problem photographing my children at will, I asked the two young ladies if they would take a picture with my kids. They seemed a little confused at first but then said of course. As I snapped a few quick photos, another group of Japanese women came by and went crazy over our kids with excitement. After I was done taking the pictures with the Kimono girls, the other women asked if they could take their pictures with my children. My little 2 year old girl was once again the most coveted of the three. When they were done, the Kimono girls came back over to us and asked if they could take pictures with their camera with my kids. Mason, Tristan and Madelyn took it all in strides and smiled and waved at the attention. As soon as we walked out of the shrine gates I saw a sign for kimono dressing. It became clear that it was that shop where the girls had gotten their clothing as an experience I’ve seen offered before in my research to get made up in full Kimono dress and then have a chance to walk around in a shrine area or special district. What I learned from all of this is that the Japanese people are just as much of tourist in their home country as we are. The amusement park we headed to next was literally one street away from the shrine and 2 from the hostel. It is called Asakusa Hanayashiki, an old and very small carnival type amusement park where the term small is only to describe the surface area it takes up. The little carnival has several rides overlapping in some areas to give kids over 20 choices of rides and attractions. The cost to get into the park was 1,000 Yen (roughly $10 U.S.) for children age 6 and older and just 500 Yen (roughly $50 U.S.) for adults. Children 5 and under were free to enter. Then you had to buy the tickets separately to enjoy the actual rides. A wrist ban for unlimited rides were available with prices varying by age. Adults accompanying a child under 4 years old did not have to pay to ride (something that I overlooked in the English instruction sheet they gave me at the entry). In total, we spend 7,800 Yen on entrance and ride tickets, about $62 USD. But we could have saved $10 had I paid more attention to the part where I didn’t need tickets for myself. The park was cute and had loads of rides for the whole family. It definitely was a good choice and we got through all but one of the rides that my 2 year old was eligible for, which was quite a lot! In all, we were there about an hour and a half. Time quickly slipped away from us when I looked at my clock and saw 11:40 a.m. on the screen. With the close proximity of the hostel, we were out of the park and at the door of K’s House in 5 minutes. We checked out of the hostel and got directions to Ueno Station where I could exchange my Japan Rail Pass voucher for my actual pass. The vouchers were purchased back in Seattle and are for foreigners only, they cannot be purchased in Japan, however, you then have to exchange the voucher for the pass in Japan. The hostel staff directed us to a short walk to a subway station that would then take us to the Ueno station. Again we encountered the subway entrances not having an elevator or escalator. There was a neighborhood map next to the station which said an elevator was located around the corner. We walked in that direction and never found it. Another maps said the station we need was just 1.2 kilometers away, under a mile, so I was hopeful we could just walk. But soon the kids were tired of walking so I found a bus stop that went to Ueno. For a mere $1.50 we hopped on and were there in 5 minutes. The handicap/stroller area is smaller than European busses, but we fit and everyone was helpful in getting us all on, suitcases and all. Signs were easy to get the passes and once that was done, we went into the JR office ticket office to get our tickets on the bullet train from Tokyo Station to Kyoto. Getting to the platform to Tokyo station was easy. They told us 3 or 4 and I just followed the signs. The train came within 5 minutes of us getting to the platform. The ride was quick and there were English announcements for each stop. Next came getting us all off the train. I did as I normally do, back the stroller off the train. 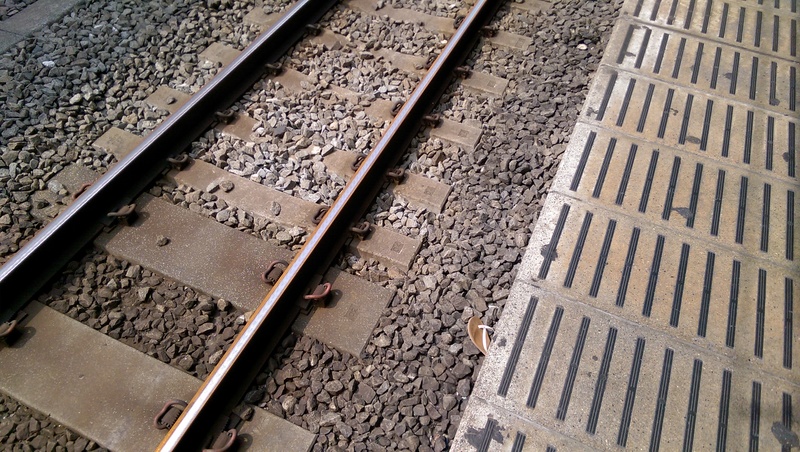 But this time, I was wearing flip flops and the heel hit the edge of the platform, pushing the sandal off my foot, and since I was in motion, my foot also moved back, allowing it to slip and fall down to the rail tracks!!! I now just had one shoe, but needed to get the boys quickly off the train with their suitcases. I got them off the train and away from the tracks amidst their questions as to why I only had one shoe on. Thankfully, since we had all our luggage, I had a spare pair of shoes in the outside pocket of my suitcase. Lesson learned, no more flip flops on train days! My flip flop that fell down between the train and platform while I was getting off the train. Once inside Tokyo station, it was a bit more difficult to know where to go for the bullet train. I forgot to ask which platform when I got the tickets and didn’t remember the Japanese name for the bullet trains (it’s Shinkansen by the way). My ticket provided no useful information. I went to a sign board to try to figure it out and while there, a beautiful young Japanese woman came up and asked me if I needed some help. She direct me towards the Shinkansen train entrances where I then asked a worker for the platform number. We still had 30 minutes to kill and picked up some snacks. Once the train arrived, we had to wait about 10 minutes for it to get on so it could be cleaned by ladies in pink uniforms and gentlemen in blue jumpsuits. We found our seats and I got the kids settled in. To save money, we just did the JR passes for myself and my 7 year old. Children under 6 are still free if they don’t take up their own seat. I figured I could have the boys share one seat and my 2 year old could sit on my lap. With a fold up arm rest there was plenty for us to sit arm and arm, and there was also tons of space between the aisles so I put the blanket that I packed on the floor for my daughter. In about 2 and a half hours we arrived in Kyoto and made our way to the hotel shuttle pick up. And now, here we are for a full week in one place! My husband has a conference the whole week at the hotel where we are staying, so we have to still be completely on our own and invisible. Which is fine, I’m sure we’ll find plenty of adventures to take! But after 36 hours of solo travel and a foam and wood bed on our first night, I am thankful for a real Western hotel, for now.